When the Karthik month (November-December) dawns, a steady stream of devotees start flowing towards the temple located in the western ghats of Kerala. They leave aside all their differences like caste, creed, class, regions and religion, and come to Sabari hill with just one single aim; to immerse themselves in the Ayyappa experience. As one reaches the temple, the names of “Swamiye Saranam Ayyappa" resonate the atmosphere. Though the devotees are all tired and exhausted after long hours of walking, the moment they see the temple of Lord Ayyappa, they get renewed strength. They forget all their earthly problems and worries. Their mind is concentrated only on the image of Ayyappa, the Lord of infinite mercy, also known as Manikanta. They sing and dance in merriment and get absorbed in the divine power that Ayyappa symbolises. They believe that in this age of Kali Yuga, it is only Lord Ayyappa who can uplift them from the illusions of the world and transcend them to the state of truth consciousness and bliss. They surrender before Lord Ayyappa and leave the question of their welfare and protection to Ayyappa and return home with a great sense of fulfillment and satisfaction. The Ayyappa temple, located at an altitude of 468 meter above sea level, in the western ghats has been attracting millions of devotees from far and near from time immemorial. Worship at Sabari Hill is indeed an exhilarating experience. Sabari Hill shrine is unique in many ways. Unlike other temples, this temple is not open all the days. The temple is open for worship only during the days of Mandalapooja (November-December), Makaravilakku (January 14 - "Makara Sankranti"), Vishu (April 14) and the first six days of each Malayalam month. Again, unlike other temples, which one can just visit, Sabari Malai calls for certain prior qualifications for the pilgrims. The devotee visiting the temple has to observe 4l days of austerity, abstinence and penance. During these days he is supposed lead a life of pure devotion, discipline and detachment. Instead of the normal dress, he or she should wear only black clothes and wear the chain of Rudraksha beads round his neck. After his duty hours, he is supposed to engage himself in devotional practices like visiting temples and participating in Bhajans. Women between the ages of 10 and 50 are not permitted to visit the shrine. Unlike other temples which the devotee can visit 'just like that', while visiting Sabari hill the devotee should necessarily be guided by a Guru. Besides, the devotee is required to carry a two-sided bundle, one side containing coconut filled with ghee hung on the front side of the head and the other side carrying personal belongs, hung backward. The ghee is offered to the idol of Lord Ayyappa as abhisheka and the coconut is put on the burning flame of fire nearby. The ghee symbolizes the Atman which is merged with the Lord and the coconut symbolizes the body which ultimately goes to the fire. There are various aspects associated with Sabari Hill temple which give a unique importance to Ayyappa worship. 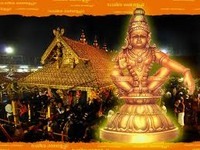 As the devotee reaches the base of the hill, the first thing that welcomes him is Pamba River. Pamba River is considered very sacred like Ganga. A bath at Pamba not only purifies the devotee but also rejuvenates him and gives him strength to trek the 6 miles steep and hard way ahead. Another significant aspect peculiar to Sabari Hill is the 18 steps that lead to the shrine. In no other temples in India, the steps leading to the shrine is given as much importance and sacredness as the 18 steps to Sabari Hill temple. The 18 steps are considered very sacred. Before the temple is opened to the public, elaborate puja is performed for the 18 steps. Invariably, the millions of devotees coming to worship Lord Ayyappa have to climb up these small 18 steps to reach out the Lord. It is believed that the 18 steps symbolize the 18 chapters of Bhagawad Gita. There is also a belief that the steps signify the gradual transformation of the devotee from the base level of Dwaita (duality) to the elevated state of Adwaita. As if to emphasize this point, the devotee, who climbs up the steps and reaches the top, finds the message above the shrine "Tatwamasi" (You are That). Mahishi, the demon, wanted to avenge the death of her brother, Mahishasura. She undertook extreme penance (Tapas) in order to attain her aim. When Brahma appeared before her, she asked for a boon that neither the power of Siva nor the power of Vishnu could cause any harm to her. Having received the boon that no single power can harm her, she started torturing Devas. Since neither Siva nor Vishnu could destroy her, it became necessary to create a combined power of Lord Siva and Vishnu to put an end to the atrocities of demon, Mahishi. the entire Universe. This, then, had to be prevented in some way. We are familiar with the story of Devas (divine beings) aligning with Asuras (demons) to churn out the nectar from Palazhi ocean. Since Asuras (demons) snatched the nectar-pot from Devas, Lord Vishnu disguised himself as Mohini and got the nectar back from the demons. When Siva happened to see Vishnu, he was captivated by the charm of Vishnu in Mohini form. It is said that as a result of their union, Sri Dharma Saastha was born, the purpose of the birth being the destruction of evil force, Mahishi and establishment of Dharma. The child was left near the banks of the river Pamba. King Rajasekara, the reigning King of Panthalam was praying Lord Siva for a son and as if like answer to his prayer, he found this baby lying on the banks of the river Pamba. Since the child was found wearing a golden necklace round his neck, he was called Manikanta. The king took Manikanta back home and brought him up. Meanwhile, the queen gave birth to a son. She feared that the presence of Manikanta would pose a threat to her son's prospect of ascending the throne. She then devised a plot to kill Mani Kanta. She acted as if she was suffering from a chronic head-ache and at her instance, the physicians suggested leopard milk as the only remedy. Manikanta volunteered to bring leopard milk and went to forest. He killed demon Mahishi on the way and returned to the Royal Court riding a tiger. Seeing Manikanta mounted on a tiger, the queen realised that Manikanta was not ordinary human being and apologised for her evil designs. Manikanta said that since the purpose of his appearance had been served, it was time for him to depart and he went to Sabari hill and chosen it as his permanent abode to continue protecting his devotees. He declared that whoever wishes to atone for their sins and seek liberation from the world of illusion should reach his abode here and surrender unto Him. As Manikanta went up the hill and took his permanent seat there, the King came there and constructed the temple around the idol of Manikanta at Sabari hill. Ever since, a steady stream of devotees were pouring towards Sabari hill carrying the burdens of life on their head. Once they relieve themselves of the head-weight (ego), their way is cleared for Self realisation. Among the many devotees who came to Sabari Hill and sat before Lord Ayyapa in worship, there was one Gopala Menon. Gopala Menon, an ardent devotee of Ayyappa, used to visit the temple almost daily during the season, sit before the deity and recite a Sanskrit song on Lord Ayyappa before the gates of the Lord got closed. This song which hailed the glory of Lord Ayyappa has been composed in Sanskrit by a devotee, Kambangudi Kulathu Iyer. The head priest was so fascinated by this song that he used to wait for Gopala Menon to come and render the song before closing the gate. Gradually, rendering this song became a regular practice. In the year 1974 Maryland Subramanyam, the famous Film producer and Director was in the process of producing a movie called 'Swami Ayyappan.' His son went to Sabari Hill to invoke the blessing of Lord Ayyappa for the success of the movie. When he was standing just before the closer of the temple, he heard the priest reciting the Harivarasanam song, as a lullaby song . The song made a tremendous impact on him. He came back and told his father that this song should be included in the picture. The song was composed by Devarajan Master in the same way in which it was sung at Sabari Mala. It was rendered in his own inimitable style by K.J. Yesudas. When the picture was released the song created a great history. Ever since, it is being heard at houses, at temples and during bhajans, consorts and recitals. With the initiative taken by Swami Vimochananda and other devotees, the Sabari Hill temple Administration agreed to play this as a lullaby song daily before closing the gate to the sanctum sanctorum. This practice is still being followed scrupulously. While Venkatesa Suprabatam rendered by M.S. Subbalakshmi is broadcast at Thirumala Tirupathi temple to awaken the Lord, the Harivarasanam song rendered by K.J. Yesudas is recited as a lullaby song at Sabari Hill. The ornaments for Lord Ayyappa, made by the king of Pandalam, are kept at safe custody and brought by a huge procession for adorning the Lord on the most auspicious day of Makara Jyoti. Makara Jyothi, which falls on 14th January, which is celebrated as Makara Sankranti in North, is indeed a divine experience. A sea of humanity converges in the precincts of Sabari Hill temple on this occasion to witness the Deepa Aradhana. As the jewellery brought from the place is adorned on the deity, Aarti (Deepa Ardhana) is offered to God. Exactly at this time, there appears a brilliant star on the mountain range; a star that reveals the presence of God in Jyoti form. This day marks the advent of Uttarayana when the sun changes direction towards the north.